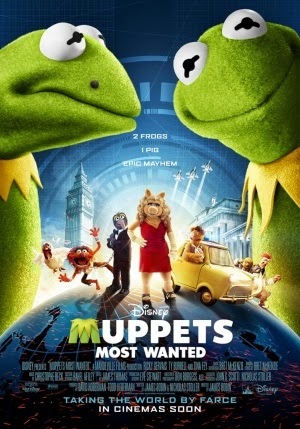 A long awaited (for some) follow up to 2011's critically acclaimed The Muppets, Muppets Most Wanted sees the loveable team undergoing a worldwide tour under the management of Dominic Badguy (Ricky Gervais), having been at a loss for how to continue following their previous film. During the escapade, Kermit the Frog is abducted and replaced by his devious doppelgänger Constantine - whose dastardly plans threaten to destroy the Muppets' reputation once and for all. The last outing of the Muppets wasn't a personal favourite of mine, although its reception amongst the general audience was rather outstanding. This sequel continues from its predecessor in more of a spiritual fashon, as there's a new cast and a new style. Most Wanted blends the classic caper genre with some standard Muppets charm, featuring an over the top evil plot, comedic police chases and, as expected, an onslaught of celebrity cameos. At 113 minutes, Muppets Most Wanted isn't a short lived experience and undoubtedly could've been cut down slightly. While it gets off to a solid if abrupt start, Most Wanted quickly loses steam as it treads through a dull middle act, saved only by the ever so delightful musical numbers. The evil plot that Constantine spearheads is lazily written into the background, with the primal focus being Kermit and the other Muppets; this can be seen as a good thing to many viewers, but it doesn't change the fact that there's a lack of inspiration to some parts of the story. Despite its flaws, Muppets Most Wanted does manage to improve upon its predecessor in some ways. But at the end of the day, there's nothing to make it stand out in a truly memorable fashion and thus it'll come and go fairly quickly for those who aren't diehard fans. It's by no means bad; the songs are awesome, the cameos hilarious, and it has an all round excellent sense of humour. But the plot does drag and is largely uninteresting, which is perhaps down to a concept that's only amusing at best.